This one is a grower not a shower. We kick it off with some travel talk which evolves into air disasters and naturally, 9/11. Robo-bees, drones, Lawnmower Man, and words that sound racist all make appearances in Episode 11. Sam Kinison, Antibiotics, Nancy Kerrigan and Tonya Harding, celebrity net worths, Bruce's deep desire to piss on animals, this episode has it all! 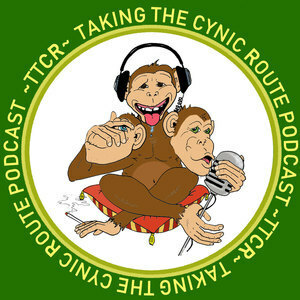 Download, Like and Share, Taking the Cynic Route. Check out our Patreon for secret shows. Subscribe to any of our social media accounts, Facebook, Twitter or Instagram. Episode 10: Mr.Collins, Is That a Banana in Your Pocket? We answer our first fan email from our first Patron! Sean asks about our opinion of Genesis, the plight of the banana and our other favorite podcasts. Guinea John asks if the news "spectrum" is purposefully dividing the people. We reminisce about our best prank calls, whether or not "Catcher in the Rye" creates hitmen, and for $5K Guinea John will give you a show to remember via Skype. Pony up that dough, Download, Like and Share. We have our first in studio guest, Polock Johnny. We start off with some poo stories and then we get poo-litical. We talk immigration, mass shootings, gun rights, and top it all off with the Mandella Effect. Do YOU remember the sweepstakes company Ed McMahon worked for? I bet you don't...Download, Like, and Share. Vacation over. Back to our cynical selves in episode 7. We discuss everything from an old racist encyclopedia to service animals. Bruce goes over a terrible"90's" list, we reminisce about past McDonald's menu items and Guinea John gives us his best Chris Rock. Download, Like, and Share. Episode 3: Would the Real Uncle Jesse Please Stand Up? On this episode we discuss how KISS is garbage, how Dukes of Hazard Uncle Jesse is superior to Full House Uncle Jesse, eating healthy and how we know nothing about potassium, the end of Kevin Spacey, and Pulp Fiction vs Reservoir Dogs.